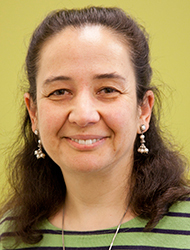 Dr. Elabbadi supervises student clinicians in the Department of Naturopathic Medicine at Bastyr Center for Natural Health. She also supervises the community care site at Ballard Northwest Senior Activity Center. Dr. Elabbadi’s clinical interests include family medicine, gastroenterology, metabolic disease and disease prevention. Her research background led her to value the role of diet and lifestyle in the initiation and progression of disease. She has additional training in craniosacral therapy. Dr. Elabbadi values patient-centered integrative medicine. She views a person’s overall health as a sum of their physical, mental and emotional states. Accordingly, she is committed to working with patients in identifying the underlying cause(s) of their illness, supporting them with safe and effective therapies during their healing journey, and empowering them to achieve their optimal health. Dr. Elabbadi completed a residency at Bastyr Center in 2014. Previously she has worked as a senior research fellow at the University of Washington and as a research scientist and postdoctoral fellow at Boston College. Her research involved vascular calcification in chronic kidney disease and the effects of caloric restriction on brain tumor growth. Dr. Elabbadi earned a Doctor of Naturopathic Medicine from Bastyr University in 2013 and a Doctor of Philosophy from Boston College in 1995. Her PhD and postdoctoral studies at Boston College focused on the biochemistry of mouse brain tumors and the effects of caloric restriction on brain tumor growth. After moving to Seattle in 2003, she worked as a senior research fellow at the University of Washington studying vascular calcification in chronic kidney disease. Her Bachelor of Science degree is in Zoology from the University of Alexandria, Egypt. She is a member of the American Association of Naturopathic Physicians; the Washington Association of Naturopathic Physicians; and the Oncology Association of Naturopathic Physicians.